With the 20th anniversary of the Pokémon franchise, it seemed like it was a guarantee that a new set of games would be announced at Pokémon Direct. Thankfully, for fans hoping this would be the case, they got their wish. For the holiday season of 2016, Pokémon Sun and Pokémon Moon will be released. Already, fans of the franchise are wondering what new surprises are in store and what the game will entail. 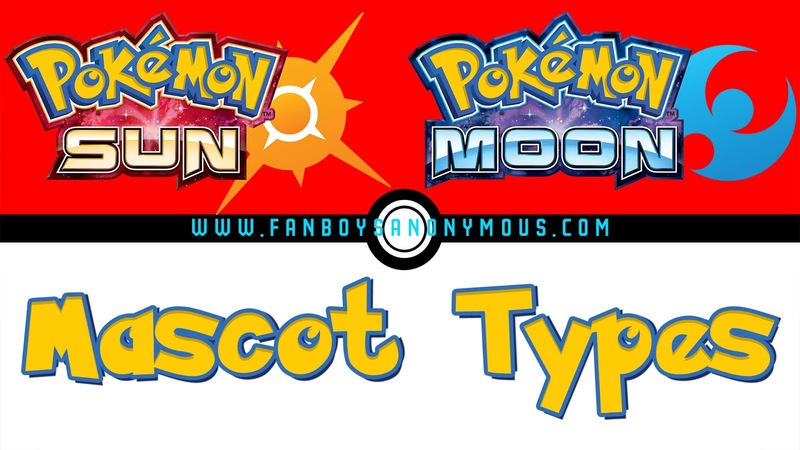 Most of that information is impossible for us to predict, but there's perhaps one thing that we actually can forecast: what types the legendary Pokémon mascots of these respective games will be. Right off the bat, we can tell that this one at the very least has to be Dark, no matter what, right? The other type that coincides with it is a little more up for debate, and there are three potential options that make sense to me. Rock, Water, and Ice all have some connection to the moon. The most obvious of the bunch is Rock, seeing as how, well, it's a giant barren rock. Ice would be the next easiest for children to understand, since it gets cold at night. Water would require a bit more of an explanation, but it boils down to how the moon is responsible for controlling the tides of the ocean. Dark/Water or Dark/Ice or less likely Dark/Rock seem as though they're the best bets. Just as we know the Moon mascot needs to have Dark as its type, the Sun one obviously needs to have Fire, and if you need an explanation for that, I feel sorry for you. Putting a secondary type on this Pokémon is a little more difficult to sort out, though. The only two ideas I can come up with are Fairy and Psychic, since those are most commonly associated with light. Since this can't be wholly weak to the Moon mascot, what would determine the proper mix of those two is which of the three options they choose for Moon. If Moon is Dark/Water, then this has to be Fairy/Fire (as the Water type will beat out the Fire, but the Fairy will beat out the Dark). If they go with Dark/Ice, then it can't use the Fairy type or it will have two advantages, so it would then need to be Psychic/Fire (Dark over Psychic, Fire over Ice). In the rare scenario where Dark/Rock was chosen for Moon, then Fairy/Fire matches up with Fairy beating out Dark and Rock beating out Fire. Fire/Psychic or Fire/Fairy are locks at this point. Although the Pokémon series doesn't always stick to the same conventions, there are normally patterns that repeat themselves. While the first generation used the starters for the mascots, the second began a tradition of using the legendaries as figureheads for the game versions. Generation III, however, introduced the third wheel. Groudon (Ruby) and Kyogre (Sapphire) were the two primary mascots and a third legendary, Rayquaza, interjected itself and became the figurehead for the Emerald version. Generation IV had Dialga (Diamond), Palkia (Pearl) and the third wheel of Giratina (Platinum). Things went a little haywire with Generation V, though, as Reshiram (Black), Zekrom (White) were indeed balanced out with a third wheel with Kyurem, but instead of having a solitary Gray version, it was marketed as Black 2 and White 2. Similarly, X and Y had Xerneas and Yveltal respectively, but no version Z was made for Zygarde. Even if there isn't a follow-up game (or games), it's not difficult to imagine that there will be some third wheel to balance out the mascots of Sun and Moon. What would be the most likely scenario for that? Earth. Before you go crazy, I know that this doesn't necessarily take place on our actual planet of Earth, so I don't expect some Pokémon Earth to be showing up on shelves. However, there is probably going to be a Pokémon that represents the connection to the planet everyone is actually on. As far as typing goes for this Pokémon, it has to be some sort of combination of Grass and either Ground or Rock. It makes far more sense to me for it to be Ground/Grass based off the balancing act of the other types we talked about before. This also fits in well with the balancing of the other types, as neither of these types has a distinct weakness or advantage over Dark, Fairy or Psychic, but can work well with the other half to an extent. If it were Fire/Fairy and Water/Dark, Ground beats Fire and is weak to Water, but Grass beats Water and is weak to Fire. That's a good trade off of 2 weaknesses and 2 strengths. It's a tad trickier with the others, unfortunately. With Rock/Dark + Fire/Fairy, there's a 3-1 ratio for Ground/Grass (Ground beats both Rock and Fire and Grass is only weak to Fire, but strong against Rock). On the flip side, Ice/Dark + Fire/Psychic makes the Ground/Grass too weak in a 0-3 ratio (both Ground and Grass are weak to Ice, and Grass is also weak to Fire). All this being considered, I'm leaning towards the Moon mascot being Water/Dark, the Sun mascot being Fire/Fairy, and the Earth-equivalent mascot to be Ground/Grass. Basically, we've got Greninja vs a new type combo vs Torterra. What do you think of this setup? Do you have any other combinations that would make sense? Do you think Clefairy gets a Mega Evolution since it's tied to Mt. Moon? Fill us in on your speculation in the comments below!